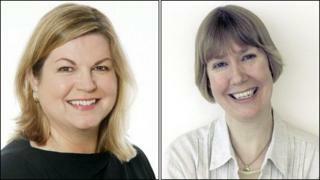 BBC Radio 4 newsreaders Charlotte Green and Harriet Cass, two of the station's best-known voices, have announced that they will leave the network next year. Both started their careers with the BBC in the 1970s and have spent 74 years at the corporation between them. Cass and Green opted to take voluntary redundancy after a re-organisation of Radio 4's presentation team resulted in two posts being closed. Controller Gwyneth Williams said they had made an "immense contribution". "We will all miss them - and I know I speak for listeners as well as colleagues," Williams said. "They've both chosen to move on and they go with my personal respect and affection as well as the good wishes of everyone who's grown to know and love them over many years." The Radio 4 presentation team will drop from 12 to 10 by the end of 2012 as the team moves from London's Television Centre and Broadcasting House into one building, New Broadcasting House. "The BBC was my first job and I thought it would be interesting for a few months," she said. "Forty years later, it's time to do other things. "It has been a real privilege to have been part of the Radio 4 family for so long. It has also been a lot of fun." Charlotte Green said she had "thoroughly enjoyed" her 34 years at the BBC. "Radio 4 listeners have always been very warm and appreciative of what I've done, whether doing the Shipping Forecast, reading the news or taking part in the News Quiz," Green said. Her best-known moment was when an item on the oldest-known recording of the human voice gave her a fit of the giggles. The next item was about the death of Oscar-winning screen-writer Abby Mann. She apologised to his family and to listeners, but the BBC had many requests to play it again. Green added: "I'll miss the buzz of live radio, but I'm really looking forward to getting involved in new projects." Fans of the pair, including The Daily Telegraph's deputy editor Benedict Brogan, expressed their distress at the news on Twitter. "Sod the reshuffle, this is the shock of the day: Charlotte Green and Harriet Cass taking 'voluntary redundancy' from BBC. Say it ain't so!" he wrote. Actor Laurence Fox, the star of ITV1 detective drama Lewis and a dad of two wrote: "Will miss Charlotte Green and Harriet Cass very much. They were the soundtrack to the morning feed. Thankyou."